La Rougerie is a small working farm in Basse-Normandie based in a Protected National Park. 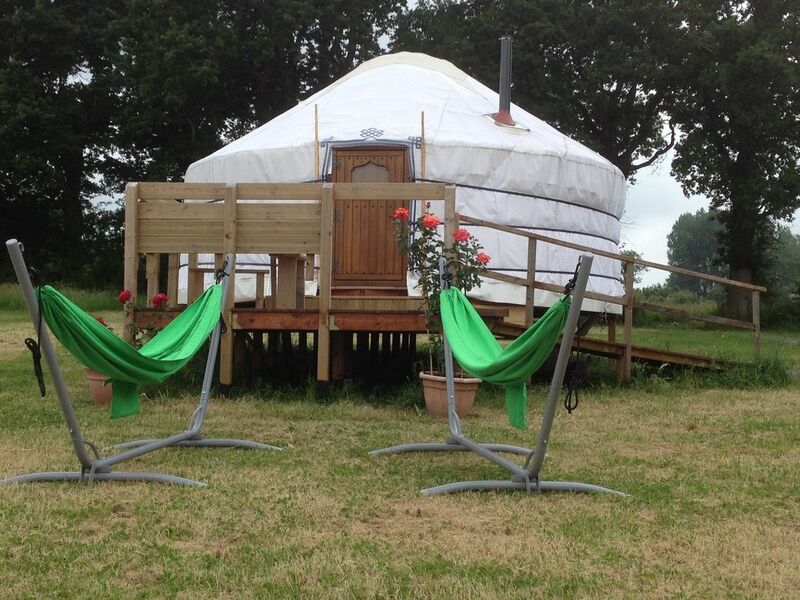 One of our fields is dedicated solely to the Yurt - a perfect escape for families or couples. The Yurt sleeps up to 4 people with a stunning King Size bed and two convertible sofas for groups / children. A wood-burning stove keeps guests warm all year round and wood is included in the price.. no hidden extras! Dining in the Yurt or on the veranda, guests can also choose to have dinner in the farmhouse or nearby restaurants... the Yurt is built on a platform with ramp for easy access and to keep you out of the mud if it rains so is available all year round. Surrounded by open countryside and stunning Oak Trees you can be sure of a peaceful stay and beautiful views... Drive through the fields and park next to the Yurt on the stone driveway - so walking through fields never has to be an issue. The Yurt really does give a whole new meaning to camping! Pets are welcome but no smoking inside the Yurt. This is an off-grid experience but with lots of home comforts. Solar lighting (inside and out), carpets, wood burning stove and a private (fully functioning) bathroom next to the yurt .... with a small campsite kitchen built next door. I am Adrian and I moved to the Normandy coast of France in 2013 to restore a farm. I have had an amazing adventure since I arrived with my two Chocolate Labradors (Sherlock & Watson). The beaches and coastline here are stunning and there is so much for everyone in this area: golf, horse riding, go-karting, wonderful walks both in the country and on the beaches. I am here to make your stay enjoyable and relaxing and I am open all year! I am also a battlefield guide for the Normandy area and DDay beaches. I fell in love with Normandy for many reasons: stunning countryside; the history of our 16th century house; incredibly friendly people; the local Norman castles; the opportunity to take care of a small piece of a Protected Natural Park with amazing wildlife; and beautiful beaches, all steeped in history. I built the guesthouse and then the Yurt, and plan to explore some more alternative building methods in the future (solar, straw, tyres & bottles). There are so many things to do here: take in the history of WW2 and the incredibly moving memorials, nature rambles, tractor rides, collect your own eggs from the free range chickens, play football with the dogs, meet the animals, visit the Chateau with the Storks, visit Saint-Lo for the restaurants and bars or just relax over a meal around the kitchen table with your host. The farm is easy to find but remote enough for the beauty and charm of the French countryside. With 15 acres of farmland there is space to enjoy the peace and tranquility yet still plenty of land to explore. As well as providing a personalised and friendly service to guests, Adrian is on hand to provide tours of the WW2 battlefield sites and trips to famous landmarks and tourist sites. The house was in the middle of the fighting in WW2 and artifacts are still being found. Separate private bathroom (20m from the Yurt) exclusively for the use of the Yurt, with sink, fully working toilet and shower and charging station. Linen and towels are provided. Guests can dine in the Yurt, on the veranda or opt for gourmet meals in the farmhouse. There are also lots of restaurants nearby with various cuisines in Bayeux, Saint-Lo or nearby villages. Kayaking and canoeing are available nearby... seasonal only. Just returned from France after two weeks in three different places and have to say this was my easily my favorite. From the moment we arrived (which was a day early due to an admin error on my part) we were made to feel right at home and we spent the first night in the farmhouse B and B itself as the Yurt was occupied (Thanks Fiona!) Perfect location for a relaxing holiday but within easy reach of stunning beaches, neaby towns, restaurants etc. The Yurt itself is amazing and has everything you need ,it has been tastefully furnished and the bed really is as comfortable as it looks! There are seperate cooking/shower/toilet facilities (just for the Yurt) and it sits in it's own field so very private. Everything was clean and well set out....it was hard to find fault with anything. Stunning Normandy beaches within an easy 30 min drive and local towns within 5 mins for supplies/amenities etc. I can recommend the local go kart track for children (up to age 14 I think) but we didn't get the chance to try the horse riding next door...maybe next time? The children loved all the animals on the farm and we were really gutted we couldn't bring some of them home! Thanks to Fiona and Adrian for being such wonderful hosts...we had a lovely few days and can't wait to come back again. We had a lovely break at the yurt with our two children. Surprisingly spacious and very comfortable even on a rainy day. The yurt had anything you need; from umbrellas for a rainy day to blankets top keep you warm on a chilly night. Lots of stuff to do locally and very helpful and friendly owners. Camping without the hassle and a comfy bed! We really enjoyed our stay, this was camping made easy. Everything you need for a holiday with children - including a hot shower, comfy bed and our own field for the kids to enjoy. Breakfast delivered to the yurt was an added bonus. We stayed here for 2 nights, but would have happily stayed for more. We felt very welcome and Fiona had thought of everything to make the stay perfect! The children also enjoyed visiting the farm animals. Would recommend and happily return for another stay. Truly wonderful, would go back tomorrow!!! From the moment we arrived to the moment we left we were made to feel like part of the family, the family consists of Fiona the lady of the farm, Adrian the lord of the farm and the most amazing guide for Normandy tours ,Sherlock and Watson the chocolate Labradors, the chickens and the rabbits!! The yurt is situated in a private field and it is sheer bliss, the most comfortable bed, in fact I slept better in the yurt than I do at home, the shower block is a very short walk away and has everything you need. At night solar lights are positioned so that you can see your way home and there are also solar powered torches in the yurt, they really have thought of everything. I honestly cannot recommend this rental highly enough; if you want a perfect holiday away from it all with fantastic hosts in beautiful surroundings then do not hesitate to book here. Thank you for taking the time to write a review - we are absolutely delighted you had such a good time, slept so well and felt so at home. We look forward to seeing you again soon. Reizende Gastgeber, zauberhafte Landschaft, tolles Ambiente. Wir haben uns sehr wohl gefühlt. Die Lage ist super für Ausflüge an die Landungstrände, Bayeux, Caen. Einzig die Küchenausstattung und -sauberkeit könnte besser sein. 2 minutes drive to two charming French Villages with local shops, bars and restaurant. 10 minutes drive to the bustling town of Saint Lo with clubs, bars and a variety of restaurants and cuisines... The farm is 5 minutes from the Chateau de la Riviere (inhabited by 30 pairs of nesting Storks).. 10 minutes drive to Carentan with lots of local places of interest for WW2. 30 minutes drive to Bayeux, 1 hour drive to Mont St Michel (UNESCO site); and 20 minutes to the nearest landing beach..
Changeover Day: Changeover days are flexible. Check-out by 11am and check-in from 2pm (we will be as flexible as possible whenever we can so please ask).